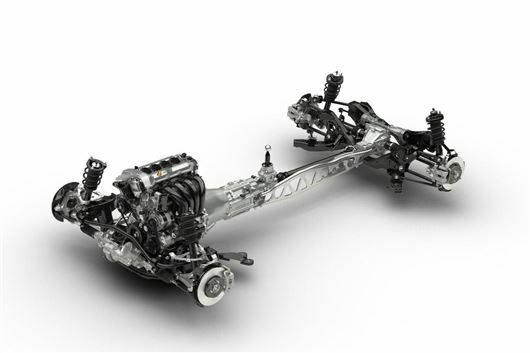 Mazda has revealed the chassis that will underpin the next-generation, all-new Mazda MX-5, due in 2015. The chassis is on display at the New York Auto Show, alongside a twenty-fifth anniversary edition of the current model. The new chassis is lighter and offers a lower centre of gravity than the current one, with the added advantage of more rigidity. The total weight of the next-generation MX-5 is expected to be little over 1000kg, which should help Mazda maintain the car’s reputation for agile, nimble handling. Engines are expected to be 1.5-litre and 2.0-litre petrols with similar power outputs to the current 126PS 1.8-litre and 160PS 2.0-litre units, although the lighter weight of the new car will yield better acceleration and improved fuel economy. The new chassis has been revealed alongside an anniversary edition model to celebrate 25 years of the MX-5. Based on the 2.0-litre 160PS Roadster Coupe, the special edition has a black painted roof, metallic red paint, white-leather seats and piano black dashboard trim. It also features gunmetal metallic alloy wheels and Bilstein dampers.